The Three Stooges are coming back to comics in April 2016 and, for the first time ever, their comic book incarnations will be produced with their actual likenesses rather than cartoon-inspired versions. It will also mark the 70th anniversary of the last original shorts filmed featuring Larry, Moe and Curly. 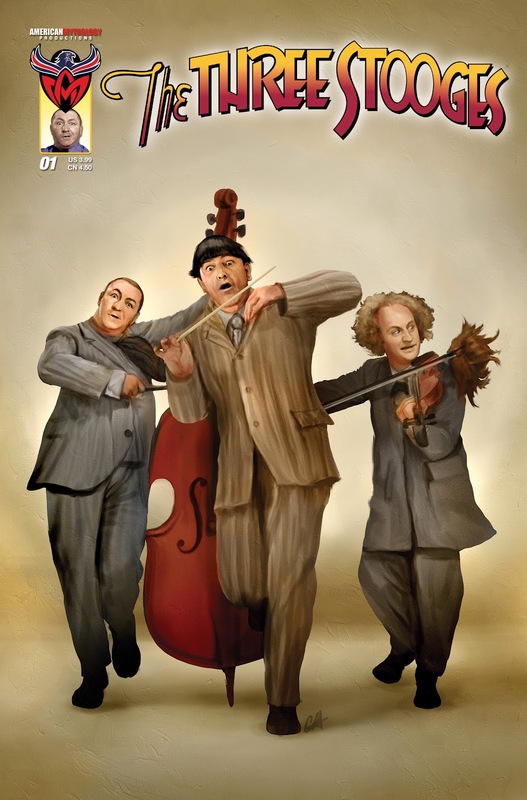 Under license from C3 Entertainment, American Mythology Productions (AM) will launch The Three Stooges as a full-color, 32-page comic book featuring their return to the printed page. The Boys will be featured in the comics section of the February 2016 edition of PREVIEWS from Diamond Comic Distributors, listed under “American Mythology Productions,” on pages #280 - 281. It carries a $3.99 U.S. cover price. The new adventures of Larry, Moe and Curly will be produced by an array of creators including S.L. Gallant (G.I. Joe), Bill Galvan (Archie), Greg Larocque (The Flash), Mark Wheatley (Breathtaker), Brendon & Brian Fraim (Vampire PA), Andrew Pepoy (Archie), S.A. Check (Maxx Fragg), J.C. Vaughn (Stargate Atlantis), and Mark L. Haynes (Stargate Atlantis), among others. Each creator participating in the program is a huge fan of The Three Stooges and is excited to be telling stories that honor their legacy.